Lottie and Lil Blog » Congratulations on Your Engagement! Celebrating your engagement is the first of the many pre-wedding parties, showers and get togethers that happen leading up to the big day. It’s exciting to think that you’re now a bride and groom-to-be! 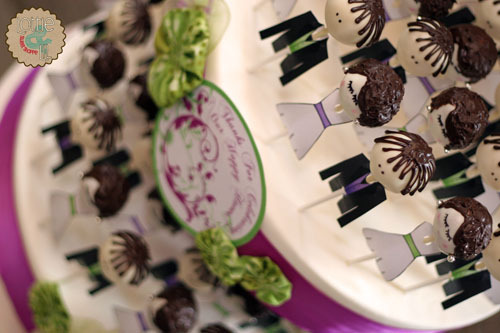 These bride and groom cake pops let all your guests know just how excited you are about your news. 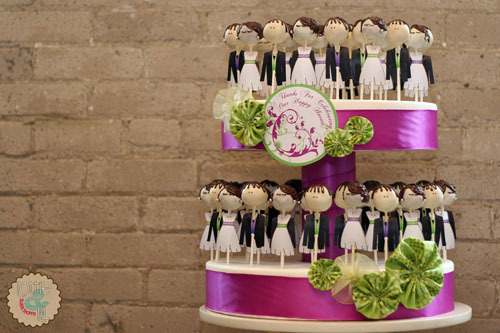 Not only does the tiered cake pop stand show off the colors you’ve chosen for your special day, but it beautifully displays the mini couples that represent the two of you! This entry was posted on Wednesday, September 19th, 2012 at 7:01 am	and is filed under Bridal Shower Pops, Engagement Pops.